After nearly two weeks in Northern CA and before that two weeks of travel to Memphis, Philadelphia and Virginia, I feel ready to crash for a few days. Sitting here in San Francisco airport, I try to catch my breath. Fortunately I did two things during this trip to help me refresh. I went to a Japanese bath and spa–a vacation in an afternoon. 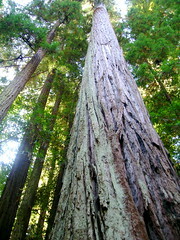 A few days later I took a short hike through a redwood forest. As an artist and an activist, I begin to realize how important it is to maintain a rhythm of creativity, work, socializing and quiet rest. Going to Quaker meeting for worship, walks in the woods, evenings with Buffy the Vampire Slayer and good laughs with friends all help me to recharge. On the road I find it virtually impossible to maintain any sort of routine. My writing, my healthy eating, my exercise all goes to the wayside. I think that is the challenge for me this year, to do the work while I still live my life. I agree with you that being on the road is exhausting, but it’s also so interesting in it’s own way. Starting this Saturday with Yearly Meeting, I’m going to be travelling for three weeks, getting home in late August. Then I start school again during the week after. Ugh. You’re not the only one whose routine of daily life gets off track by being on the road. This time I’m going to try really hard to keep up with my routine so that I don’t burn out part way through England. No suggestions but if you figure it out, share the wealth. The only thing I know to do is to take walks (morning, preferably). Even in urban environments they can be journeys of discovery. Take a collapsible umbrella in your luggage so that that the weather won’t deter. Like mark said, no suggestions here, but if you figure things out, please do share! Hope you find some answers!